If you use Podia to send emails (newsletter, drip email campaigns, etc), you'll want to consider setting up your custom domain. Email providers such as Gmail, Yahoo, and many other mail services require you to verify your custom domain before allowing services like Podia to send emails on your behalf. While the verification protects you from random strangers sending emails from your account, it also means there's an extra step involved if you want to use Podia to send emails from your custom domain. If someone replies to your email, it will still go to whichever email is linked to your Podia account, but that email address won't be displayed in the original message. Why do I want to send email with my custom domain? Ready to send emails from your custom domain name? Step 1: Contact us ([email protected]) with the email address you want to send from. This should be the same as your current Podia email address (if not, you can change your Podia email address). Step 3: We’ll provide you with both the Host and the TXT Value, then you add the record to wherever you have your name servers (i.e. - Hover, GoDaddy, Register.com, etc.). Just FYI, a name server isn't necessarily where you bought your domain name, but for this example, let's say I bought my domain through GoDaddy and have my nameservers set up there as well. Step 4: Let us know when the DNS record been added and we'll verify the domain and activate it internally. Step 5: We'll email you when your custom domain is ready. 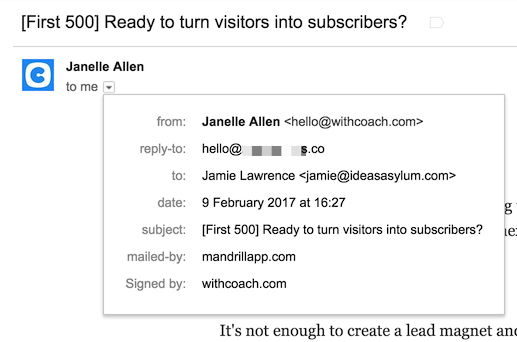 Once ready, any newsletters or drip email campaigns will now appear to come from your confirmed email address. All in all, the process should take 24-48 hours. No problem! To get help, email us ([email protected]) or just click the blue chat icon in the bottom right of the screen.